TORONTO—This fall the Art Gallery of Ontario (AGO) will host a major exhibition celebrating the experimental and contemplative works of Joseph Mallord William Turner (1775–1851), a giant of British art. Opening on Oct. 31, 2015, J.M.W. Turner: Painting Set Free features more than 50 large-scale paintings and watercolours on loan from Tate Britain and makes the case that the radical works created in the final 15 years of Turner’s career, with their arresting use of light, represent a fulfillment of the artist’s upward trajectory. “By bringing an exhibition of this calibre to Toronto this fall, the AGO will offer an exceptional experience to its members and visitors, and we’re delighted to be partnering with one of the world’s most renowned art institutions to do so,” says Stephanie Smith, the AGO’s Chief Curator. “Turner was a great artist who reimagined the medium of painting to create powerful and beautiful works. Through his art, he invites us to bear witness to the rapidly changing world of his time and to delight in the power of the artistic imagination." Premiered at Tate Britain in September 2014 and heralded by critics across the U.K. as “an exciting, entrancing show” (The Guardian) and “sensational” (London Evening Standard), J.M.W. Turner: Painting Set Free focuses on the final and most experimental phase of the artist’s career. Beginning in 1835 and closing with his last exhibitions at the Royal Academy in 1850, the exhibition sets out to show how Turner’s final years were a time of exceptional energy and vigour, initiated by one of his most wide-ranging tours of Europe. The installation at the AGO will be coordinated by Lloyd DeWitt, AGO Curator of European Art. Turner’s late works, with their emphasis on atmosphere, are famous for their sublime colour palettes, textures and arresting use of light. Highlights of the exhibition include the large historical works Ancient Rome: Agrippina Landing with the Ashes of Germanicus (exhibited 1839); Snow Storm - Steam Boat off a Harbour’s Mouth (exhibited 1842) and the iconic Angel Standing in the Sun (exhibited 1846); as well as numerous and magnificent watercolours, including The Blue Rigi, Sunrise (1842) and the haunting Fire at the Grand Storehouse of the Tower of London (1841). J.M.W. Turner: Painting Set Free runs at the AGO until Jan. 31, 2016. A 250-page, soft-cover catalogue will accompany the exhibition. Published by the Tate and edited by David Blayney Brown, Amy Concannon and Sam Smiles, J.M.W. Turner: Painting Set Free features more than 100 colour plates and will be available for sale in shopAGO for $63. AGO members will be offered free admission to J.M.W. Turner: Painting Set Free and exclusive previews in the days leading up to the exhibition’s public opening. More information on the benefits of AGO membership can be found at www.ago.net/general-membership. 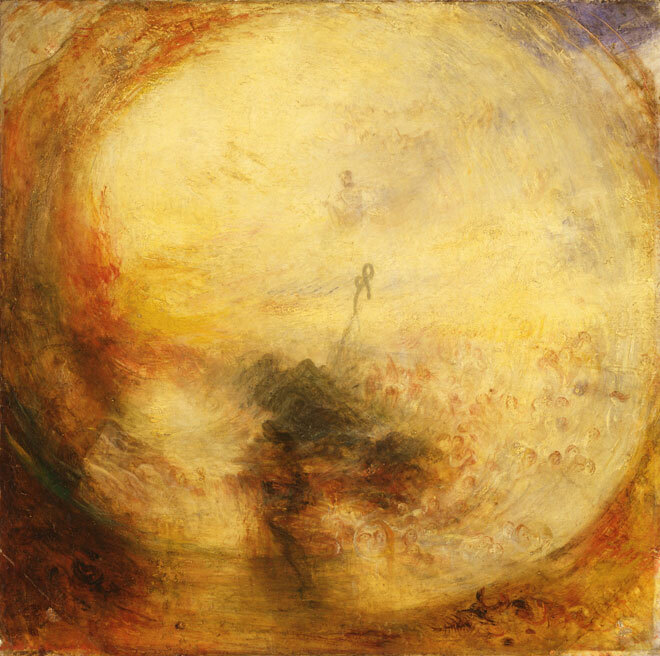 J.M.W.Turner: Painting Set Free is organized by Tate Britain.